Defcon Zero is a range of 20mm miniatures representing contemporary US forces. 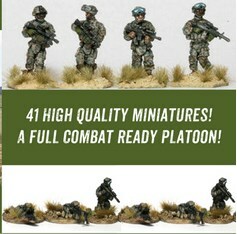 Today, Covert Intervention Games releases some US light infantry with all its support weapons in a set of 41 miniatures. Why are they using Elhiem Miniatures but calling them a different brand name, are they pirated figures?